One cup butter, one cup brown sugar, two-thirds cup molasses, three cups flour, one-half cup sour milk, one cup raisins, one cup currants, one teaspoon soda in milk, four eggs, citron and spice to taste. 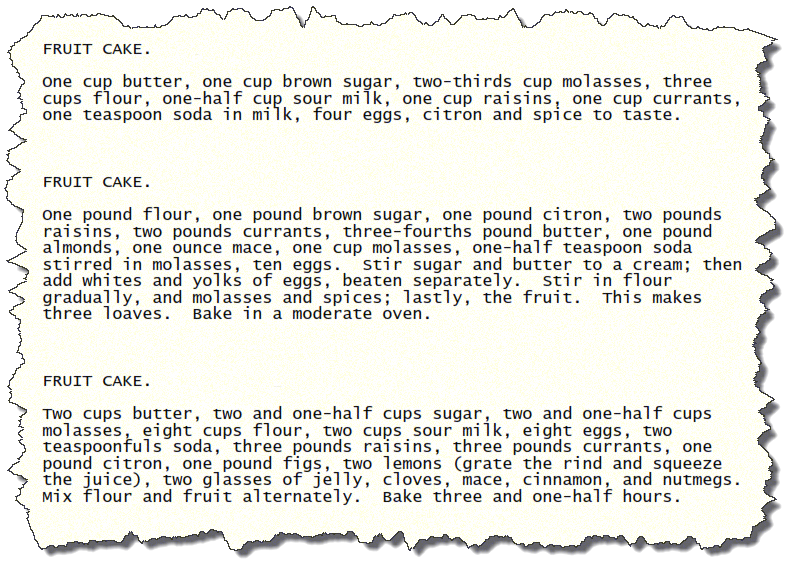 One pound flour, one pound brown sugar, one pound citron, two pounds raisins, two pounds currants, three-fourths pound butter, one pound almonds, one ounce mace, one cup molasses, one-half teaspoon soda stirred in molasses, ten eggs. Stir sugar and butter to a cream; then add whites and yolks of eggs, beaten separately. Stir in flour gradually, and molasses and spices; lastly, the fruit. This makes three loaves. Bake in a moderate oven. Two cups butter, two and one-half cups sugar, two and one-half cups molasses, eight cups flour, two cups sour milk, eight eggs, two teaspoonfuls soda, three pounds raisins, three pounds currants, one pound citron, one pound figs, two lemons (grate the rind and squeeze the juice), two glasses of jelly, cloves, mace, cinnamon, and nutmegs. Mix flour and fruit alternately. Bake three and one-half hours.